While Shaun was here, I took him to breakfast at my new favorite Restaurant here in the Seattle area. 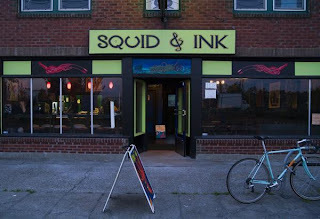 This funky little place is not far off the freeway in Seattle's Georgetown neighborhood. If you're passing thru, check it OUT! Oh, man, I LOVE LOVE them for so many reasons; 1) it's got that whole indie/punk/DIY vibe, 2) it's open late, and 3) the food is delicious, VEGAN and hearty. Oh, and 4) it serves breakfast till 4 p.m.
First up, to explain this scary picture; that Canadian (more specifically Quebec) favorite "Poutine"; which is basically a dish consisting of French fries, topped with fresh cheese curds, covered with brown gravy. We dug right into the vegan version (which may explain the messy photo) which was quite deelish. Admittedly, neither of us have ever had the"original" to compare, but who cares? 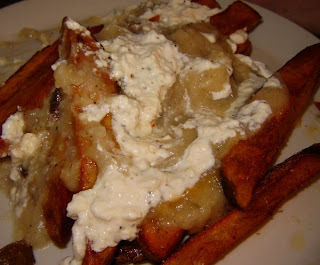 Fries, gravy and creamy melting curds of vegan cheese... sounds pretty dang good to me. Rich and decadent too, we brought lots home! I probably shouldn't admit how much we ordered, but I'll say we also brought home leftovers of incredible vegan fish and chips, and perfect crispy, salty sweet potato fries. On previous visits I've had the seitan-fried steak and gravy, one of my all-time favorite meals EVER! More fun restaurant food to follow. (Just what I need!). Looks delicious! I wish there were more vegan restaurants by me! Now THAT looks like a funky, fun, delicious restaurant - what a great find! So happy to see you went and liked it! 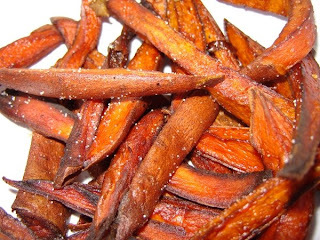 Your pictures make me want some fries asap. You've never tried "Poutine"? I can't believe it. That "Poutine" looks so amazing, I would love to try it.